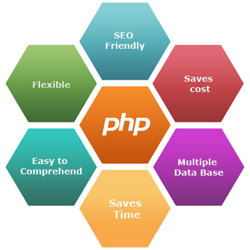 BPWORKS offers offshore PHP development services across the globe. With over a decade's experience, our experts have enabled us to become a trusted PHP development service provider by completing highly challenging projects and satisfying our clients across the world. We combine both creativity and imagination to render the 100% user-friendly and interactive web applications and web solutions. Our team of skilled developers are capable of handling programming and development services, covering all needs of global clients. Our talented programmers live up to the mark and take care all your PHP web development requirements including website development, corporate website development, etc. We make complete use of the open source scripting language to create lively web pages. Our developers are well versed with PHP (LAMP), MySQL, Apache & Linux. This allows us to offer the best solutions and ensure maximum contentment for our customers.